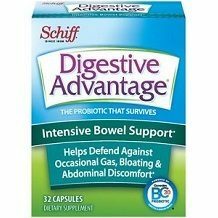 Read our review below for a product called Digestive Advantage Intensive Bowel Support from Schiff Vitamins. It is a product that is designed to promote long term digestive and immune health, with continued use. It is intended to provide relief from gas, bloating, diarrhea and constipation. The manufacturer claims that this product mainly contains BC30, a type of probiotic that is able to withstand stomach acid hundred times more than leading probiotics and yogurts. The enzymes such as protease, amylase and lipase work together in supporting the digestive health. Each of them play a different role in protecting the digestive tract. For instance Lipase helps when pancreas is unable to release enough digestive enzymes into the stomach to digest food. Amylase helps digest carbohydrates, while Protease helps with the digestion of different types of protein. 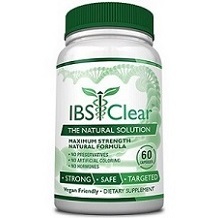 BC 30 Bicillus helps improves diarrhea and abdominal pain in those that suffer with IBS. Other ingredients: maltodextrin, hypromellose, silicon dioxide, magnesium stearate, dextrin stearic acid, microcrystalline, and titanium dioxide. The recommended dosage is one capsule taken with the largest meal of the day. However, the manufacturer claims that some adults might benefit from taking one capsules with two or more meals a day. For children, contents of one capsule can be mixed with drink or food. The product contains wheat and soy. Therefore, individuals who are allergic to these ingredients should not consume it. Digestive Advantage Intensive Bowel Support is available from the manufacturers’ website and third-party retailers. 32 capsules cost $9.70, and 96 capsules cost $25.04. Through our research we did not find any information about the manufacturer’s guarantee, which could mean that it does not exist. The lack of guarantee points that the manufacturer has no confidence on the effectiveness of the product. It also means that the customer stands to lose, while the manufacturer will be gaining. Schiff Vitamins Digestive Advantage Intensive Bowel Support could possibly help in managing digestive issues. The ingredients contained in it are natural and are known to be help with stomach related issues. The price is also reasonable. However there are few things that we are concerned about.The product contains wheat and soy, which automatically excludes individuals who are allergic to these ingredients. The manufacturer states that it may take 7 to 14 days for the product to work. This statement makes us doubt the effectiveness of this product, if it can take such a long time to work. We are even more skeptical because there is no money-back guarantee, which means that the customer is at risk of losing money and not benefiting from it. We recommend that you rather buy a product that will work faster and one that is supported by the manufacturer.